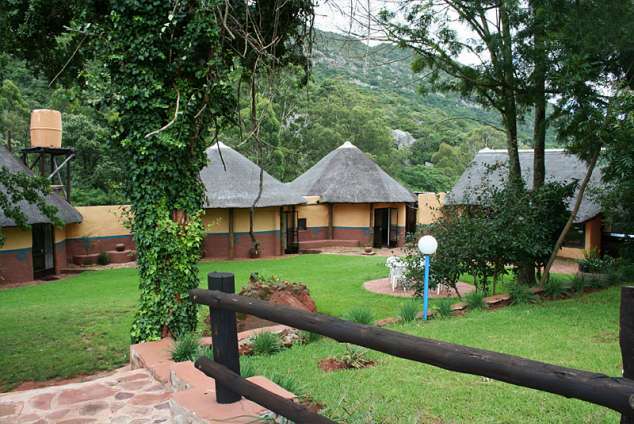 Lokovhela Mountain Cottages - Makhado (Louis Trichardt) Accommodation. Experience PURE Nature on a Natural Heritage site in of the HEART of the Soutpansberg Mountains. Lokovhela Mountain Cottages is an ideal stop over for young or old travelers to the north. We have one superior family VALLEY VIEW COTTAGE and 4 en-suite chalets as self-catering accommodation for BACKPACKER students under 30 years old at a communal sharing discounted rate. The 4 chalets are also ideal for small groups or families, who want to enjoy the tranquil hiking trails next to the mountain river or just relax at the swimming pool. Lokovhela Mountain Cottages is a small SELF-CATERING Lodge or Backpacker, remotely located in our Morning Sun Nature Reserve, situated at a high altitude where the malaria carrying mosquito cannot survive. We have had no incidence of malaria and are regarded as a malaria free destination. Hidden in the Mountains which is why we do NOT have a reliable Cellphone or Wi Fi connection and there is NO SHOP Facilities. Solar power, wireless internet and pure drinking water available. We are a small ECO- friendly well ventilated, thatch roof Lodge which is why we do NOT have air conditioners on our premises. There is NO wireless internet and very limited to cell phone reception. We have a boreholes on the property and the water is great for drinking. With an open plan dining room lounge, communal self-catering kitchen sharing. A total of 3 beds in each room or sharing as a Backpacker dormitory style. Backpackers under 30 years with proof of a student-card sharing the rooms as a dormitory style will receive a discounted rate which is subject to availability. 2 x two chalets units each with an en-suite bathroom. Each unit can be made up with a king size bed or 2 single beds, with a further side bed that can be utilised for a child. Minimum of 2 adults Rate is required for a Family with discounted children, teenager or pensioner rates (proof of age will be required). A private kitchen dining, lounge and outside veranda braai area. One Main bedroom with an en-suite bathroom which can be made up as a king size bed or 2 single beds. One second bedroom with 4 single beds sharing the main bathroom or an outside shower and toilet. Lounge with a double side bed/couch that can be utilised for two children. Minimum of 2 adults and 6 additional children sharing OR 6 adults & 2 children sharing the couch. If you book the whole Lokovhela Mountain Cottages with its 4x Standard chalets PLUS one Superior Valley View cottage a discount will be arranged. A total of 20 beds can be accommodated. PLEASE do NOT use the "Google map" Coordinates!!! Use our DIRECTON MAP to avoid landing up in the wrong place. 31413 page views since 20 Dec, 2004. Last updated on 20 Jul, 2018.